This Ice Screw Kit can help to secure your kite to the ice for set up and for launching and landing your on frozen lakes. When Snowkiting, Kiteskiing and Kite Snowboarding, It can be great to have a helping hand. 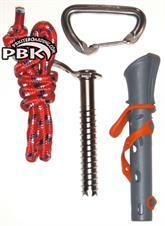 The PBK Ice Screw Kit make the Difference. The Kit can help Kiters be more independent while setting up their kites. If you'd like to learn what the Ice Screw Kit is all about and how we use it. We'd suggest you take one of our Snowkiting Lessons.